It’s funny that, while I’ve written dozens and dozens of radio reviews over the years, I’ve never written even a single review that included an HD radio. Well, the time to begin is now: HD radio, here we come. HD Radio is a trademarked term for iBiquity’s in-band on-channel (IBOC) digital radio technology used by AM and FM radio stations to transmit audio and data by using a digital signal embedded “on-frequency” immediately above and below a station’s standard analog signal, providing the means to listen to the same program in either HD (digital radio with less noise) or as a standard broadcast (analog radio with standard sound quality). The HD format also provides the means for a single radio station to simultaneously broadcast one or more different programs in addition to the program being transmitted on the radio station’s analog channel. [HD radio] was selected by the U.S. Federal Communications Commission (FCC) in 2002 as a digital audio broadcasting method for the United States, and is the only digital system approved by the FCC for digital AM/FM broadcasts in the United States. For my own part I had mostly ignored HD radio, assuming there would be few stations to listen to from my rural home location. That is, until recently, when I purchased a car that has built-in HD radio reception. I was impressed by the number of commercial stations I found that I can receive via HD radio. In truth, only a handful of the mainstream HD station offerings had any appeal for me, but I really took notice when I received a commercial-free jazz station via the HD2 channel of my favorite NPR member station, WFAE. Having been a jazz fan since I studied music in college, I was intrigued: could a portable HD radio receive this distant HD station reliably? I had my doubts; moreover, I really didn’t want to purchase a radio, then be obligated to send it back if it didn’t receive anything. Instead, I contacted Sangean. The company was more than happy to send me a loaner radio for review. I requested the HDR-16––at the time it was Sangean’s most affordable HD portable, one about which a number of SWLing Post readers had expressed their curiosity. The Sangean HDR-16 is a simple radio with a modern design. The chassis is a glossy black hard plastic and feels substantial. It has a useful fold-out carry handle and substantial telescoping whip antenna. The front face features a 16-character two-line backlit display, five function buttons, five dedicated preset buttons, and a dedicated power button. On the right side of the radio you’ll find a dedicated (two function) tuning knob and smaller volume/tone knob. The left side of the radio features an “aux-in” port, a “rec-out” port, an earphone jack, and a 7.5 volt “DC-in” port. The HDR-16 sports two 2.5” front-facing speakers that deliver crisp audio that can be customized with simple treble/bass EQ settings. I found increasing the treble just a bit and the bass quite a lot produced the best audio for music broadcasts. Even the default audio settings are pretty good, however. The HDR-16 doesn’t have the rich fidelity of the Eton Field BT or the Tecsun S-8800, but it does offer stereo sound that is room filling and pleasant. Sangean obviously took audio fidelity seriously when designing the HDR-16. The left side features AUX in, Record Out, Earphone and a DC power port. Note that the the HDR-16 sounds especially good in spoken word/news broadcasts. The Sangean HDR-16 is a very simple and intuitive radio to operate. I sorted out all of its functions simply by following button and knob labels, but even the most tech-challenged person in your family could give the owner’s manual a single read-through and operate the HDR-16 with ease. But let’s get one gripe out of the way…perhaps a case of simplicity gone too far: the HDR-16 only has five station preset buttons. Five! Actually, it offers a total of 10 memory allocations: five for AM, five for FM. Still…even in my rural market, I can easily program ten station memories on an FM radio, especially since HD Radio channels offer that many more new options. But the HDR-16 forces me to curate my presets down to a mere five stations per band. In my view, this strict limitation is an unfortunate design oversight. The HDR-16 is an AM/FM radio that receives both legacy analog broadcasts and HD/digital broadcasts on both bands. I’ll break down performance by mode and band below. Of course, what I was most eager to explore was FM HD reception from my home. After unpacking the HDR-16, I placed the radio on my kitchen countertop and initiated an HD Seek scan via the dedicated button on the front panel. Couldn’t have been easier. The HDR-16’s scan/seek functionality is impressively quick. I quickly found there were a number of commercial radio stations––about four, to be exact––that I could instantly receive with little to no effort. Mind you, I live in a relatively rural market in a mountainous area. No doubt, if I initiated an HD radio search in LA or New York City, the dial would be chock-full of terrific stations. All of the HD radio stations I received were either local, or powerhouses from neighboring markets. I was disappointed to find that I could not receive my most desired station, WFAE HD2. I then moved the HDR-16 to a south-facing window and tuned to WFAE’s FM frequency of 90.7. I found I could easily receive the analog station and its RDS information, but still had no option to listen to HD2. After tinkering with antenna position and placement in our kitchen window, a sweet spot for reception was found, and voila! WFAE HD2 came in fully decoded, without any drops. Recalling the days when I used to tinker with the rabbit ears on a TV, once I found that sweet spot, I carefully left the HDR-16 alone and didn’t move it further. As a result, over the course of the afternoon, I had nearly 100% copy from WFAE HD2. I knew WFAE was a fringe station and checked their propagation map for HD radio. My location was actually outside of the fringe reception area. I looked up GPS coordinates of the WFAE 90.7 MHz transmitting site and found it is exactly 101 miles/162 km from my home. Obviously, the HDR-16 is a sensitive HD radio on FM! Via the 1/8″ stereo AUX in jack, you can use the HDR-16 as amplified stereo speakers for your favorite portable music device. Turns out, FM HD reception is pretty flaky when dealing with fringe stations, though. Over the course of the next weeks, I tried the HDR-16 in different positions and locations. There was only one spot in my house where the HDR-16 could get reliable reception of WFAE HD2. When I started the evaluation, it was August; our trees were still had a canopy full of green leaves. Sangean kindly allowed me to hang onto the HDR-16 to see if reception improved in late fall when all of the leaves were off the trees. As I write this review, we’re in winter, and the tree branches are bare. But curiously, reception of WFAE’s fringe signal is about the same as before. Nor have I noticed any difference in the reception of other commercial stations. The HDR-16 accepts four C cells. My conclusion is that the HDR-16 is a true performer on the FM band in HD mode. I have no other HD radios with which to compare it, but based on what I know about HD radio, this rig certainly exceeded my expectations. The HDR-16 can also receive AM HD signals. There are far fewer AM HD broadcasters on the air, however. In fact, one of the first in our region dropped their HD coverage last year due to a lack of listeners. With that said, I’ve read that a number of HDR-16 owners who live in the vicinity of AM HD broadcasters love the fact they get a digital audio quality signal on the AM band. One SWLing Post reader recently told me he even gets the occasional night-time AM HD DX signal with an HDR-16. There are no local AM HD stations near me, and despite my best efforts, I never decoded an AM HD broadcaster in the evening. Perhaps if I did a little research and planning, then inductively coupled the HDR-16 to a MW mag-loop antenna, it would increase my chances. I’ve done almost as much analog FM listening on the HDR-16 as I have HD listening. The HDR-16 can hold its own with most of my portable radios, in that it can receive all of my benchmark FM stations, and even some fringe analog stations. RDS decoding also seems to be quite effective, even with fringe stations. AM (mediumwave) performance is surprisingly good. Perhaps my expectations were low, but I expected analog AM reception to be an afterthought. Or perhaps to have acceptable AM HD reception, Sangean had to put some extra effort into overall AM performance. Honestly, I don’t know, but what I do know is I’ve been pleased with the HDR-16 on the AM band. The AGC is pretty stable, noise relatively low, and sensitivity better than on other similar digital radios. Many of my shortwave portables, like the PL-660, PL-310ET, and PL-880, could outperform the HDR-16 on the AM band, but frankly performance is on a level that it’s going to please most radio listeners. I’ve even had luck getting solid copy from one of my favorite AM DX stations, CFZM (740 kHz) with the HDR-16. Should you purchase the HDR-16 for AM/MW DXing? No; there are better radios for this exclusive function. But for what I would consider a “bonus” band on a digital radio, I’m very pleased. Every radio has its pros and cons. When I begin a review of a radio, I take notes from the very beginning so that I don’t forget some of my initial impressions. Here’s the list I’ve developed over the time I’ve spent evaluating the HDR-16. Fringe HD stations may continuously flip between digital and analog, annoying when HD station content and analog broadcast content are quite different Update: I recently tried to have the receiver replicate this behavior but it did not, so I’m striking it from the cons list! Can I recommend the HDR-16? Absolutely. If you’re looking for an AM/FM HD radio that’s well-rounded, simple to operate, and provides quality audio, I don’t believe you could go wrong with the HDR-16. The HDR-16 has proven to me that it’s a worthy FM HD receiver as it’s sensitive enough to snag fringe HD stations with some reliability. I’m certain I could design a small FM antenna and get 100% copy from my favorite HD station 101 miles from my home. I think the HDR-16 would be a safe purchase for anyone, as it’s easy to operate, relatively compact, and makes the process of seeking HD stations a breeze. I’m especially pleased with the HDR-16’s AM analog reception. It pleasantly surpassed my expectations and makes it easy to recommend the HDR-16. The HDR-16 is one of the few HD portables that also includes AM HD reception. If you’re looking for a well-rounded HD and analog portable, grab the HDR-16. If you’re looking for a mediumwave DX machine, go for a benchmark mediumwave radio instead, like a GE Super Radio, C.Crane CC Radio 2E, CC Radio EP Pro or even a “Holy Grail” vintage Panasonic RF-2200. I like Sangean’s high gloss finish (though it does show fingerprints rather well!). I’m very tempted to purchase the HDR-16; I’ve found it difficult to justify, though. Living in a rural location, I have fewer HD stations to choose from––all but one are commercial, chock-full of advertising, and lack any real variety and diversity. I am very pleased with WFAE’s jazz station on HD2, but it’s hard to justify a $100 purchase just to receive one station over the air. Especially since I can easily stream WFAE HD2 from my Sangean WFR-28, Como Audio Solo, or Amazon Echo. But if I lived in an urban area, with the accompanying diverse radio market, I wouldn’t hesitate to buy the HDR-16. In closing…I should add that there’s another tempting Sangean HD radio coming just around the corner: the HDR-14. It’ll be priced lower than the HDR-16, and is even more compact, suggesting that it might make an excellent portable for the traveler. I will certainly review the HDR-14 when it’s available, as I’ll be very curious if its equally effective at snagging fringe HD FM stations. Note that the HDR-14, unlike the HDR-16, has only one speaker, so I doubt audio fidelity will match that of the HDR-16, which should be a better choice for home and local use. This entry was posted in AM, Digital Modes, FM, HD Radio, News, Portable Radio, Radios, Reviews and tagged HD Radio, HRD-16, Radio Reviews, Sangean, Sangean HDR-16, Sangean HDR-16 Review on January 16, 2018 by Thomas. Comparing side to side reception performance on RSP1A vs. RSP1 on medium wave and shortwave using SDR Console 3. Audio level is uneven because two laptops were used. Antenna is the same, 80m OCF dipole. This entry was posted in Mediumwave, News, Reviews, Shortwave Radio, Shortwave Radio Reviews, Software Defined Radio and tagged Ivan Cholakov (NO2CW), Radio Reviews, RSP, RSP1, RSP1A, SDRplay, SDRplay RSP1, SDRplay RSP1A, Videos on December 1, 2017 by Thomas. The workshop closed around noon on Friday so I spent part of the afternoon walking around the nearby Darty consumer electronics and appliance store. I wanted to buy a DAB/DAB+ portable receiver just to see what Europe was doing with digital radio. I bought a recently introduced Sony XDR-S41D DAB/DAB+/FM(with RDS) receiver for 79€ (about 11€ off list price). I can use it in North America to listen to FM and take it with me when I visit Europe for DAB/DAB+ as well as FM. It has reasonable sound from its 8-cm speaker and pretty good stereo sound on headphones. 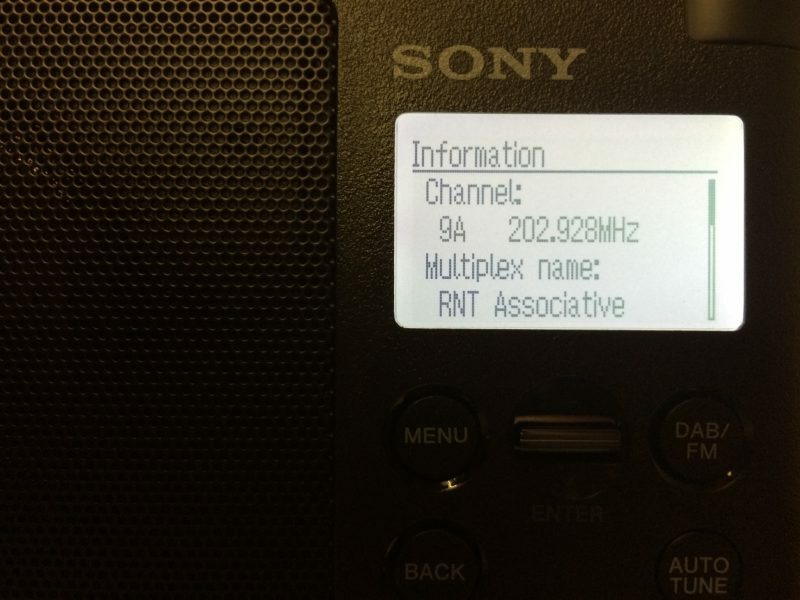 It has an automatic search mode on both DAB/DAB+ and FM and creates a list of available stations. In my hotel room in the 13th arrondisement, I could receive 46 DAB+ stations. One of the stations is World Radio Paris (WRP) and they provide English language programming 24 hours per day from BBC World Service, Public Radio International, Radio France International, and Radio Canada International, among others as well as their own programming. There is no line output from the receiver but I was able to use the earphone output and crank the volume to maximum to get an acceptable recording level without noticeable distortion. Happy with my purchase and can’t wait to go back to Europe again, say to England, to try out DAB+ there. You don’t see SW receivers in North American consumer electronics stores anymore and I’ve not spotted any in airport duty free stores lately either. I’ve been listening to the XDR-S41D at home and it sounds pretty good on FM, too, and does a good job of displaying the RDS information although a character or two is sometimes cut off the end of the data but that could be the fault of the station. Need to investigate that some more. 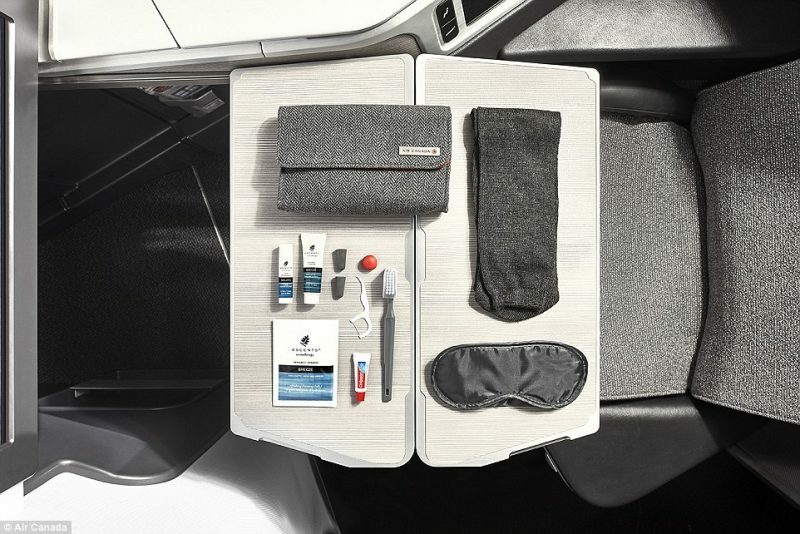 By the way, the radio doesn’t come with a case but I found (just before I was going to toss it) that it just fits in the magnetic-clasp case of one of those Air Canada amenities kits that they give you in business class (see photo below). Thank you for sharing your thoughts, Richard! The Sony XDR-S41D sounds like a keeper for sure and is certainly compact enough to easily accompany you on travels to Europe. I was not aware of World Radio Paris either–I see they’re available via TuneIn, so I’ll add them to my WiFi radio station favorites! 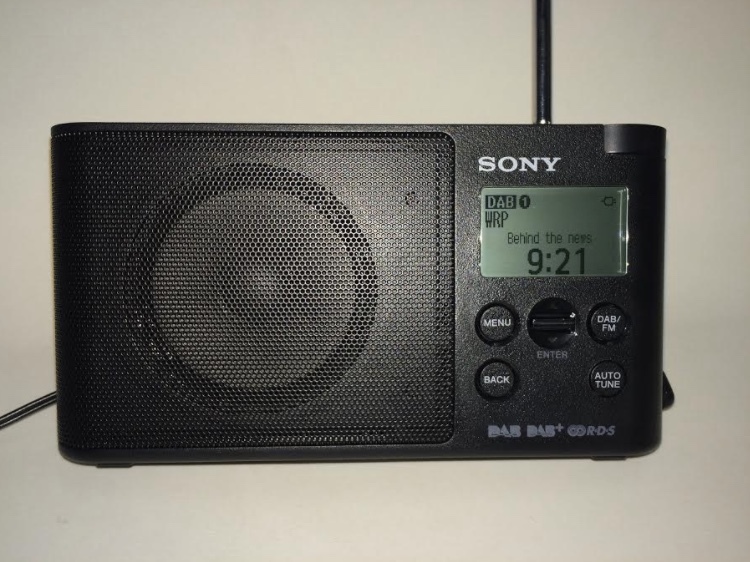 This entry was posted in FM, News, Radios, Reviews and tagged DAB+, FM, Paris, Radio Reviews, RDS, Richard Langley, Sony XDR-S41D, Sony XDR-S41D Review, World Radio Paris on July 24, 2017 by Thomas.